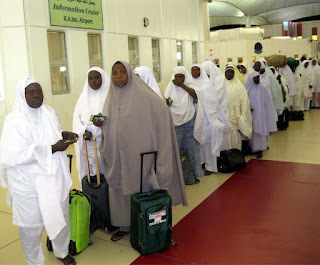 According to Vanguard Nigeria, "The Central Bank of Nigeria, CBN, on Thursday, directed banks and authorised forex dealers to sell the Pilgrims Travelling Allowance, PTA, to intending Hajj pilgrims at a concessionary exchange rate of N197 to $1". The CBN also said: “Each pilgrim is entitled to purchase a minimum of $750.00 and maximum of US$1,000.00 as PTA. The Federal Government has approved that intending pilgrims are to be sold the PTA at a concessionary exchange rate of N197.00 to the US dollar. Reading this post, reminded me of a popular childhood song, Lost and found, careless owner, stupid finder. In reality, we (Nigerians) have lost our leaders, we are still searching for them though. We are the owners, because without our votes they won't be in power. That's just my own opinion sha..
Now back to the topic. What about Christians, if they are going to Jerusalem for pilgrimage nko, are they gonna be sold dollar at N197? What of the people that have been begging CBN to allow them purchase the dollar at normal rates, but were denied this request, because according to them, it's not the government's business if you want to send your child abroad for Education or you sell imported goods. According to a friend, "we are now subsidizing dollar for religion"..IK. How is the CBN going to pay for the charges made by the pilgrims exchange? Is it coming out of their personal accounts or from the country's pocket, e.g. Nigeria's tax payers taxes, etc? The federal government approved this. Buhari and Osinbanjo are aware of this. How does pilgrimage help the economy, that they have to agree that they need to subsidize the dollar for the Hajj pilgrims. The government can't say this news wasn't gonna cause a controversy in the country. It looks like because most of the people in government are from the North, that's why there is always this partiality/favouritism for the Northerners. Christians need to be united to fight for their own pilgrimage travelling allowance to Jerusalem oooo. But, are Nigerians fighting against this news? Why is it that we can fight for other countries problems, but not our own. If this happened abroad, there would have been a riot by now by the citizens, Nigerians would already be changing their social media accounts display pictures to the other country's flag to show "support". Where's the support for us now? We don't have it. Why? Because we haven't fought for ourselves, so how do we expect others to fight for us. Thanks for reading. Let's stand up and fight against impartiality in Nigeria. If Jonathan did this, am sure the whole world would have heard by now. Just stating the obvious. P.S: I have no beef with the Northerners ooo. It just happens to be that most of our leaders are from the North, if they were Southerners, I would still post this same comments. Is only in Nigeria that sponsor religious activities, bad precedent has been set Christian will soon go for pilgrimage so very soon they will have their own fair share of the cake. I just hope so.